Located to the southeast of the Municipality of Chongqing, the most extensive and populated of the four Chinese municipalities (Beijing, Tianjin, Shanghai and Chongqing), the autonomous county of Tujia and Miao of Youyang (酉阳土家族苗族自治县) is the largest county of the Municipality. Called Youzhou in ancient times, Youyang represents a real cultural cradle for the 18 ethnic minorities that live there. Among these, the most consistent is the Tujia ethnic minority (whose history might go back to the Ba people who occupied the area of the modern province of Chongqing about 2,500 years ago), followed then by the Miao, Han, Hui, and other ethnic minorities. Without a doubt the crown jewel of this county is Taohuayuan, 桃花源, or “The peach blossom spring”, a scenic area that got the highest rating of 5A (AAAAA). There are two main ways to get to Youyang, both starting from Chongqing: the first is to take the train from the north station of Chongqing (Chongqing Beizhan, 重庆北站) and the second is to take a bus from the west station in Chongqing (Chongqing Xizhan Qichezhan, 重庆西站汽车站). If you decide to take the train, you first need to go to the north station in Chongqing. The metro is always the best and least expensive choice. Get off at the Chongqing Beizhan Nanguangchang stop, 重庆北站南广场 (South square of the north station of Chongqing) of Line 3 on the metro. There’s also another stop for the station coming from Line 10 of the metro. Be careful: this stop is also at the north station, but at the north square on the other side of the tracks. If you get off at this stop by mistake, you can take bus 663 which you’ll find immediately outside of the station and will take you to the other side in 10 minutes. The trip toward Youyang will last five hours on average with a class K train (this is not a high speed train. For this route there’s only class K trains or similar). Like all other Chinese trains, the price varies according to the type of seat you choose: it goes from about 53.5 Yuan for a hard seat going up to about 158.5 Yuan for the soft sleeper. The train stops at the Youyang station, which unfortunately is not located in the city, but is about 30 minutes away by bus. Don’t worry, the bus station is located right outside the really small station in Youyang. The price for getting into the city is 10 Yuan. This mini bus will bring you directly to the bus station in Youyang, generally the south station (there’s also a north bus station, easily reached on foot from the south station in 10 minutes). If, instead, you decide to go by bus, no problem. From the west station in Chongqing buses leave for Youyang at regular intervals, for a price of 110 Yuan a ride. In five/six hours you’ll be in Youyang and if you’re fortunate, the bus will be equipped with TVs that show one of the most famous documentaries in China, Shejianshang De Zhongguo, 舌尖上的中国, or “A Bite of China”, dedicated to the history of Chinese cooking. I highly recommend it, but if you’re hungry and don’t have anything to eat it’s real torture! The return bus for Chongqing will be at the north bus station in Youyang. It’s really easy to find transportation in China, with many apps and websites that can help you. The best, and the one that I always recommend to whoever wants to arrange their own travel in the Middle Kingdom, is the website CTrip or Xiecheng 携程 (there’s also a cell phone app that you can download from the Chinese App store). An excellent alternative to CTrip is the site Qunar 去哪儿, which also offers a cell phone app. There’s definitely no lack of hotels and hostels in China. You’ll be surrounded by writing like Jiudian 酒店 or Binguan 宾馆 on every street corner and each will propose something different. The majority are family run, so they’ll make you feel at home. For one or two nights I recommend the Youyang Wankelai Binguan, 酉阳万客来宾馆, very close to the south bus station and is surrounded by everything you might need, like grocers (literally everywhere), mini markets, pharmacies, banks, restaurants – you name it. The average price for a single room with a private bath (Turkish style) is around 30/40 Yuan a night, without breakfast which you could have in one of the little restaurants in the area or by something at one of the mini markets. Contrary to what you might think, Youyang and its surroundings offer a lot from a tourism point of view, such as parks and ancient villages that can easily be reached by bus. Below I will propose a travel itinerary of two days and one night that will allow you visit the terraced rice paddies near Youyang, Taohuayuan and the ancient city of Longtan. To visit all of these you’ll have to get to Youyang early in the afternoon, so choose your train or bus well, keeping in mind what was mentioned above. The first thing I recommend you do is go straight to the terraced rice paddies, which is more “difficult” to get to and further away, so that the next day can be entirely dedicated to the other two destinations and the return to Chongqing. You have two alternatives to get to this place. The first is to take a bus from the north station to Huatian, 花田. Attention: the last trip leaves around 12:30, so if you decide to take the bus, plan accordingly. If you don’t find the right bus, just ask any driver where you can find the bus for Huatian Titian, 花田梯田. The second option is more expensive but quicker and more comfortable, because you won’t have problems with the timetable. You’ll be freer, but your wallet will be lighter as well. This option requires that you call a taxi. You can call it the “old fashioned way” by standing on the side of the road or call a Didi conveniently through your smartphone or (you can use Wechat, Alipay or one of the many taxi apps to call one). 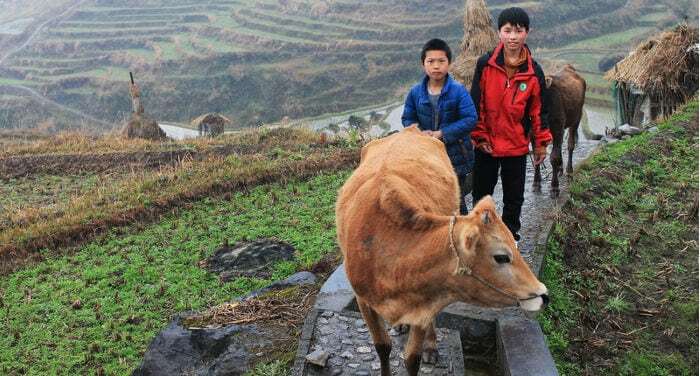 The cost of a round trip will be around 300/400 Yuan (it depends on your haggling ability, but if you’re a small group of 3/4 people you could lower the cost by dividing it among you) and the travel time will be around an hour to get to the top of a hill in a small farming town. From the town, you can get to a panoramic platform on foot from which you can admire the terraced rice paddies and the picturesque Chinese farmers at work. There’s also a little path used by the locals to bring their animals to work, which will bring you down below the terraces. If instead you decide to take the paved road, you’ll come to the top of a little hill where you can better admire the spectacle of the terraces full of water. With a good pair of shoes you could also get into the rice paddies without being afraid of the mud and following the various steps to have a better view compared to the one offered from the road. For fans of photography, this place will gift you a variety of faces that you’ll be hard pressed to find elsewhere. These farmers, despite the daily fatigue, always give foreigners a smile when they pass through these parts, which aren’t a whole lot. The first stop ends here. Take the same taxi (which will stay and wait for you) to bring you back to Youyang for dinner and a night in the hotel. Attention: during your taxi ride or any other occasion, you may be offered a cigarette. Accept it, even if you don’t smoke; the Chinese consider it a sign of respect and not accepting it would be considered discourteous and in poor form. If they try to light the cigarette (but you’re not a smoker), kindly say that you prefer to smoke it later so as to avoid an unpleasant misunderstanding. If you have a smoker with you, you can pass it to them and then pass the carton back half-filled. Everyone’s happy. 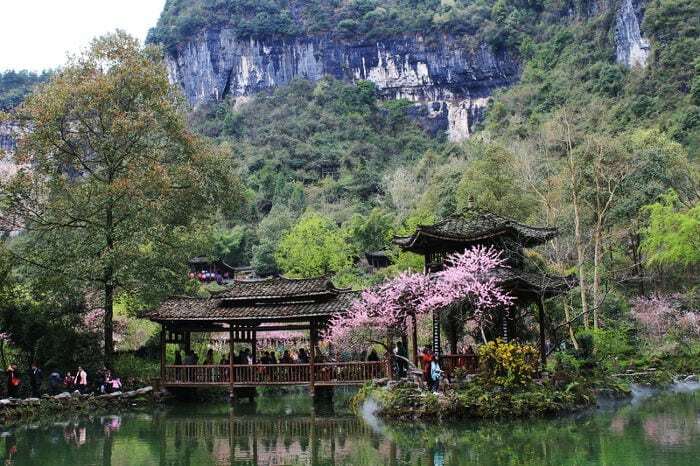 Youyang is the cradle of an actual earthly paradise, Taohuayuan or “the Peach Blossom spring”. This is an area of about 50 square km immersed in the most luxurious nature and represents a prototype of paradise hidden to the world, as it was described by the poet Tao Yuanming during the eastern Jin dynasty (317-420) in his piece 桃花源记, “Chronicles from the peach blossom spring”. Getting to this earthly paradise is very easy. Take city bus 101 from Youyang toward Yangguang Xigu, 阳光溪谷 (you’ll find it in virtually every bus stop, there aren’t many). The bus cuts the city in two, and in about 20 minutes you’ll be standing in the space of the park. The stop is called Taoyuan Jinshui’an, 桃园金水岸. Once there you can choose to see the ancient city of Youzhou, 酉州, or directly buy tickets for the park. Youzhou isn’t much more than a large road that climbs toward the top of the hill with new buildings in traditional style that host shops and hotels. You can choose to take it to the end and return to the entrance of the park in 20 minutes, but you can also skip it if you’re drawn to the beauty of the park. There are two ways to get into the park, each of which have two different prices. Personally, I recommend that you buy your park ticket together with one for the caves, instead of just one for the park. Buy the ticket directly at the square where you arrived. If you choose the first option, a shuttle included in the price will bring you to the top to the entrance of the caves and from there (after a first artificial downhill section) you’ll have your jaw drop in front of the immensity and beauty of the caves. 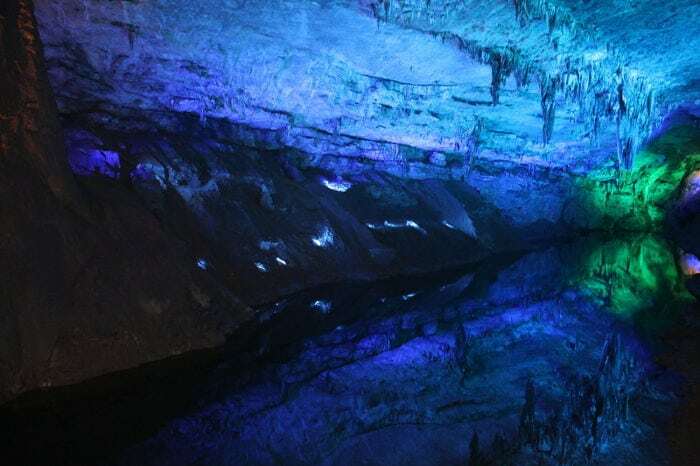 The caves will treat you to a breathtaking spectacle of stalactites, rocks, underground lakes and bridges that will not leave you regretting having paid about 130 Yuan per ticket. It will be a really pleasant 2 km walk which in the end will bring you to the actual entrance to the park. Legend says that Fuxi, one of the three mythical Chinese rulers together with Nuwa and Shen Nong, lived in these caverns. If instead you choose the first option, you’ll find the entrance in front of Youzhou gate. The ticket will be about half the price of the one that includes the caves. Once you enter into the actual park, another spectacle will appear in front of your eyes. If you choose the season of peach blossoms, you can admire these magnificent trees in bloom that surround the area with little lakes, bridges, bamboo and small temples. A lovely relaxing walk immersed in the freshness of this landscape will make you forget the chaotic confusion of Chinese cities. Additionally, you could taste the typical foods of the region in one of the many open green spaces, rest (if you need to) and continue your walk. Visiting the caves and park will take up about 3 hours of your time, so if you start your visit around 9 in the morning, when you leave the park you’ll still have a few hours to take the last of 18 buses for Chongqing (the last train is around 15 and as I explained before it is harder to reach). In this case I recommend a small tour of a few hours to the ancient city of Longtan, 龙潭古镇. You can take the bus from either the north or south stations. The ticket costs around 10 Yuan per trip and takes about 40 minutes to get there. The driver will leave you at the entrance to the old city. Go in and wander around the roads of the city. Lose yourself among its inhabitants and houses and enjoy the peace that contrasts with the confusion of cars outside the entrance to the ancient city. An hour is more than enough to see the major points of interest that are well marked by signs. As a last stop, go out the way you came in and in less than one km you’ll find the Longtan bus station. Take the first bus for Youyang and from there leave for Chongqing. You’ll also have time to buy something to eat outside the station. Remember: the trip lasts between 5 and 6 hours and will certainly play that documentary that will make your mouth water. Don’t let it take you by surprise! I'm a fan of the Chinese language, books, and editorial tradition. I spent the last few months in China studying at Tsinghua University of Beijing and serving an internship at the Italian Consulate in Chongqing. I love to travel anywhere and in any way, but Asia has the priority. You can find me on Linkedin!